When you don’t have the funds to purchase a color copier, or only need one on a temporary basis, then color copier rental may be a great option. CBT has several units available to rent, and we can rent to businesses throughout the greater Charlotte area. No matter how large or small your business is, if you can benefit from a new copier, CBT is ready to serve you through color copier rental! 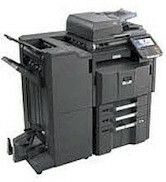 Our fastest color copier available for rent is the Kyocera KM-C4035E. This copier can print up to 35 color copies per minute and has a 100 sheet document feeder with duplex option. We also offer the KM-C3232, which has a top color copy/print speed of 32 copies for minute. The KM-C3225is our final choice for a large color copier rental, and its color copy speed is 25 copies per minute. All three of our large color copiers have network and printing capabilities, two 500 sheet drawers and 1,000 or 3,000 sheet finisher and stapling options. If you feel that your color copying needs are small, or you have limited space for your color copier, then the Kyocera FS-C2126MFP desktop color copier may be the best choice. It prints at speeds of 28 pages per minute and has 500 sheet paper trays with a 8 1/2 by 11 inch capacity. You can print duplex at a 600 x 600 DPI resolution. Fax is included with this copier. If you are interested in color copier rentals from CBT, we are happy to help! We will rent by the day, week, month or year, depending on your needs. Our goal is to create a rental contract and agreement that truly serves your needs. Whether you need a copier for a one-day convention or are looking for a long-term rental agreement for your office facility, you can trust CBT to help. Once you choose your copier and rental period, we will delivery the equipment to your facility, even if it’s the weekend. We will then install and set up the copier, and train your team on how to use it. Should we need to load any drivers onto your computers, we will do this as well. Once the machine is installed at your facility, we will support you through 24/7 technical support. For long-term rentals, we will check in monthly to ensure the copier is fully functional and to see if you need a faster or slower option. You can swap out your existing copier for a different one any time you feel it is needed. Color copier rentals can improve the function of your Charlotte area business. Contact CBT today to discuss your options, and finally have the copier you need for professional document copying in full color.